An unflinching look at nineteenth- and twentieth-century African American leaders and their visionary legacies. In an accessible, conversational format, Cornel West, with distinguished scholar Christa Buschendorf, provides a fresh perspective on six revolutionary African American leaders: Frederick Douglass, W. E. B. Du Bois, Martin Luther King Jr., Ella Baker, Malcolm X, and Ida B. Wells. In dialogue with Buschendorf, West examines the impact of these men and women on their own eras and across the decades. He not only rediscovers the integrity and commitment within these passionate advocates but also their fault lines. 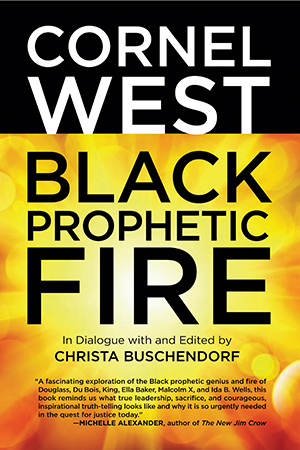 By providing new insights that humanize all of these well-known figures, in the engrossing dialogue with Buschendorf, and in his insightful introduction and powerful closing essay, Cornel West takes an important step in rekindling the Black prophetic fire so essential in the age of Obama. "A fascinating exploration of the black prophetic genius and fire of Douglass, Du Bois, King, Ella Baker, Malcolm X, and Ida B. Wells, this book reminds us what true leadership, sacrifice, and courageous, inspirational truth-telling looks like and why it is so urgently needed in the quest for justice today." Are we witnessing the death of Black prophetic fire in our time? Are we experiencing the demise of the Black prophetic tradition in present-day America? Do the great prophetic figures and social movements no longer resonate in the depth of our souls? Have we forgotten how beautiful it is to be on fire for justice? These are some of the questions I wrestle with in this book. Since the assassination of Martin Luther King Jr., it is clear that something has died in Black America. The last great efforts for Black collective triumph were inspired by the massive rebellions in response to Dr. King’s murder. Yet these gallant actions were met with increasing repression and clever strategies of co-optation by the powers that be. The fundamental shift from a we-consciousness to an I-consciousness reflected not only a growing sense of Black collective defeat but also a Black embrace of the seductive myth of individualism in American culture. Black people once put a premium on serving the community, lifting others, and finding joy in empowering others. Today, most Black people have succumbed to individualistic projects in pursuit of wealth, health, and status. Black people once had a strong prophetic tradition of lifting every voice. Today, most Black people engage in the petty practice of chasing dollars. American society is ruled by big money, and American culture is a way of life obsessed with money. This is true for capitalist societies and cultures around the world. The Black prophetic tradition—along with the prophetic traditions of other groups—is a strong counter-force to these tendencies of our times. Integrity cannot be reduced to cupidity, decency cannot be reduced to chicanery, and justice cannot be reduced to market price. The fundamental motivation for this book is to resurrect Black prophetic fire in our day—especially among the younger generation. I want to reinvigorate the Black prophetic tradition and to keep alive the memory of Black prophetic figures and movements. I consider the Black prophetic tradition one of the greatest treasures in the modern world. It has been the leaven in the American democratic loaf. Without the Black prophetic tradition, much of the best of America would be lost and some of the best of the modern world would be forgotten. All the great figures in this book courageously raised their voices in order to bear witness to people’s suffering. These Black prophetic figures are connected to collective efforts to overcome injustice and make the world a better place for everyone. Even as distinct individuals, they are driven by a we-consciousness that is concerned with the needs of others. More importantly, they are willing to renounce petty pleasures and accept awesome burdens. Tremendous sacrifice and painful loneliness sit at the center of who they are and what they do. Yet we are deeply indebted to who they were and what they did. Unfortunately, their mainstream reception is shaped according to the cultural icon of the self-made man or the individual charismatic leader. This is especially true for the male figures. This is not to say that they did not fulfill the function of leaders and speakers of their organizations. But I want to point out that any conception of the charismatic leader severed from social movements is false. I consider leaders and movements to be inseparable. There is no Frederick Douglass without the Abolitionist movement. There is no W. E. B. Du Bois without the Pan-Africanist, international workers’, and Black freedom movements. There is no Martin Luther King Jr. without the anti-imperialist, workers’, and civil rights movements. There is no Ella Baker without the anti-US-apartheid and Puerto Rican independence movements. There is no Malcolm X without the Black Nationalist and human rights movements. And there is no Ida B. Wells without the anti-US-terrorist and Black women’s movements. There is a gender difference in regard to men’s and women’s roles assigned in social movements. This shapes their reception in history books and in popular culture. Male figures are prominent on the basis of their highly visible positions. They often are chosen to represent the movement, usually due to their charismatic qualities. Yet despite the charisma of many women leaders, it is difficult for them to be chosen to represent the movement. They are often confined to untiring efforts in organizing the movement. As a consequence, even when women give speeches, even when they contribute to the political thinking of movements, their words are not taken as seriously as they ought to be. One of the aims of our dialogues about the Black prophetic tradition is to bear witness to the fiery prophetic spirit of Ida B. Wells by presenting examples of her fearless speech and action, and to bear witness to the deep democratic sensibilities of Ella Baker, who understood better than any of the others the fundamental role of movements in bringing about fundamental social change. This book becomes even more important in the age of Obama, precisely because the presence of a Black president in the White House complicates our understanding of the Black prophetic tradition. If high status in American society and white points of reference are the measure of the Black freedom movement, then this moment in Black history is the ultimate success. But if the suffering of Black people—especially Black poor and working people—is the ultimate measure of the Black freedom movement, then this moment in Black history is catastrophic—sadly continuous with the past. With the Black middle class losing nearly 60 percent of its wealth, the Black working class devastated with stagnating wages and increasing prices, and the Black poor ravaged by massive unemployment, decrepit schools, indecent housing, and hyperincarceration in the new Jim Crow, the age of Obama looks bleak through the lens of the Black prophetic tradition. This prophetic viewpoint is not a personal attack on a Black president; rather it is a wholesale indictment of the system led by a complicitous Black president. The Black prophetic tradition highlights the crucial role of social movements in the United States and abroad. The Occupy Wall Street movement was a global response to the thirty-year class war from above, which pushed the middle class into the ranks of the working class and poor, and even further exacerbated the sufferings of working-class and poor people. The 2008 financial crisis, primarily caused by the systemic greed of unregulated Wall Street oligarchs and their bailout by the Wall Street–dominated US government, revealed the degree to which American society is ruled by big money. And the fact that not one Wall Street bank executive—despite massive criminality on Wall Street—has gone to jail, while any poor and, especially, Black person caught with crack goes straight to prison, shows just how unjust our justice system is. The realities of the power of big banks and corporations are hidden and concealed by a corporate media that specializes in generating weapons of mass distraction. This systemic concealment also holds for the military-industrial complex, be it the Pentagon or the CIA. Rarely are the death-dealing activities of both institutions made public to the American citizenry. And courageous whistle-blowers—such as Chelsea Manning, Julian Assange, John Kiriakou, and Edward Snowden—who reveal to the public the corrupt activities of the US government are severely punished. Even the recent discussions about drones dropping bombs on innocent civilians remain confined to American citizens. The thousands of non-American civilian victims—including hundreds of children—receive little or no attention in the corporate media. The Black prophetic tradition claims that the life of a precious baby in Pakistan, Yemen, Somalia, Haiti, Gaza, Tel Aviv, Lagos, Bogotá, or anywhere else has the same value as a precious baby in the USA. The Black prophetic tradition accents the fightback of poor and working people, be it in the United States against big money, be it in the Middle East against Arab autocratic rule or Israeli occupation, be it against African authoritarian governments abetted by US forces or Chinese money, be it in Latin America against oligarchic regimes in collaboration with big banks and corporations, or be it in Europe against austerity measures that benefit big creditors and punish everyday people. In short, the Black prophetic tradition is local in content and international in character. The deep hope shot through this dialogue is that Black prophetic fire never dies, that the Black prophetic tradition forever flourishes, and that a new wave of young brothers and sisters of all colors see and feel that it is a beautiful thing to be on fire for justice and that there is no greater joy than inspiring and empowering others—especially the least of these, the precious and priceless wretched of the earth! Three: Moral Fire—Martin Luther King Jr.
Dr. Cornell West was interviewed on The Late Show with David Letterman on 3/16/15. Watch Part 1 and Part 2 here.